Ridge vents properly installed increase energy efficiency. 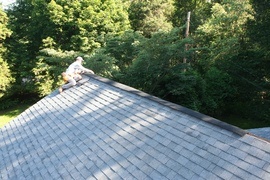 Ridge vent typically comes in 4 ft. sections. The typical home needs roughly 60 ft. at $10 per section, this adds up to about $150. This is the DIY price (without labor costs factored in). To have a 60 foot long ridge vent installed professionally, a roofing contractor will charge approximately $475 (including both labor and material).